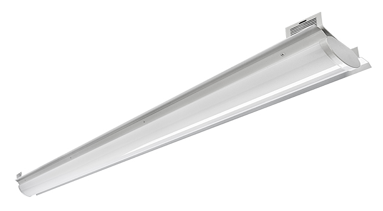 The Aleo LSR™ Series Linear LED Retrofit Kit delivers industry-leading performance with deep energy savings and continuous dimming. Easy and quick installation reduces labor cost and optimizes ROI. The retrofit kit eliminates the need to replace existing luminaire housing, which reduces install time and disposal/removal costs. The LSR™ kit transforms utility strips into high-efficiency, architectural luminaires. Excellent for general utility applications to retrofit existing utility strip/channels. Parking garage, warehouse, offices, restrooms, storage units, stairwell. and wiring. Installs on existing strip housing.